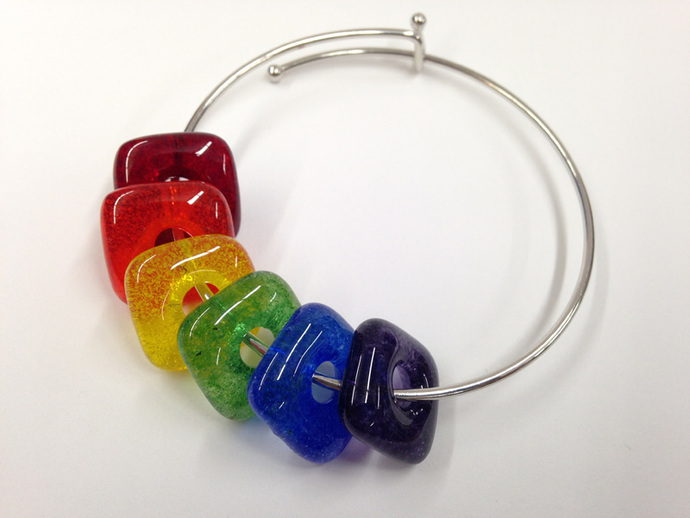 THIS BANGLE BRACELET has 6 square "Pate de Verre" FUSED GLASS RAINBOW BEADS and is created by layering clear glass frit with small bits of colored frits in the hues of the Rainbow into a mold and then melting to 1425 degrees in a glass kiln. Each bead measures approx. 5/8" across with a 3/16" hole. THIS LISTING IS FOR 1 BRACELET with 1 each of Red, Orange, Yellow, Green, Blue and Violet Glass beads. THESE BEADS ARE SILKY SMOOTH TO THE TOUCH...great for meditation to counteract any worries. LOOKING FOR MORE HANDCRAFTED SUPPLIES for your Jewelry or other crafts? THESE GLASS BEADS ARE KILN ANNEALED for strength and durability, but, it is still fragile if dropped on a hard surface.